See our Poetry Site: Book read recently. Harry Potter books. Buddhism. How to Write Poetry. On Handwriting. the World's first professional instructional DVD for Nordic Walking. Starring Lise Meloche (Director David McMahon). Buy "Nordic Walking"
It's imperative that you consult your physician before you embark on any exercise program. Nordic Walking (for example) is strenuous exercise and not suitable for everyone. regarding his or her ability to perform an exercise program safely. If you do decide to begin, warm up your muscles before stretching them. You can walk briskly, jog, dance salsa, have a pillow fight, jump jacks, or chase the cat. Or do low-intensity Nordic Walking. But warm up for 5 or 10 minutes. Calorie Karma. The secret use of other people's momentum in weight loss. 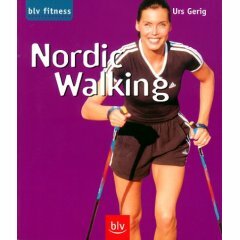 Nordic Walking books and equipment. Pilates Specifics - some basic exercises. Nordic Walking: what it is. benefits. how to. stretches. history. good links. books and equipment. Fitness walking with Nordic Walking poles. An efficient, aerobic way to improve your physical condition. Uses Nordic Walking poles that engage the arms and upper body to help propel the body during walking. 'Walking in the normal way', but with the addition of poles as extensions of the arms, so that on the backward arm-swing some propulsion forward and some lift to the body is achieved. This makes it easier to move forward and reduces load on the lower body. Can be 30% more efficient than regular walking. Benefit depends on exercise intensity. Cooper Research Institute (in 2000) claimed 46% increase in efficiency achievable. Lowers stress on the body, especially feet, ankles, legs, knees, and hips. Also your back may thank you. Creates resistance, which can increase bone density. Encourages a more erect carriage, due to the chest opening during the backwards thrust of the poles. On hiking trails, GREAT for helping you balance your way past mud without it pouring into your boots, and helping you clamber under/over downed trees. Provides a potentially useful defensive weapon against aggressive animals. Warm-up by starting at a relaxed and easy pace. then allow alternate poles to start touching the ground again. Stretch after about 10 minutes of warm-up. The main part of the work-out is at a steady pace that raises the heart rate to 65-85% of the age-related maximum. Once you have built stamina, try to walk for exercise periods of an hour or more. Cool-down by slowing down for the last 10 minutes, to end at a relaxed and easy pace. Stretch at the end, to minimize subsequent stiffness. The International Nordic Walking Association also has suggestions for uphill and downhill techniques. Do some of the same stretches you would do for your lower body if you were going walking or hiking. But because you will be using poles in your arms, be sure to stretch your upper body too. And because you will tend to go maybe 30% faster with the poles, you need to stretch your lower body especially well to take that speed into account. Stretch muscles after they are warmed-up. Also warm them down at the end. Stretches all the main muscle groups. Stretch gradually with no sudden jerks or bounces. Hold each stretch half a minute. Increase the degree of stretch gently as the muscle allows. Relax the stretch gradually and then repeat. FORWARD AND BACK SQUATS for THIGHS AND GLUTES.
" Stand with feet apart at shoulder width and with knees and toes facing forwards. Hold the pole with knuckles facing forward on your shoulders behind your head or in front of you at shoulder height. Squat down at an angle of about 90 degrees (heels on the ground) and straighten up again. You can add a push up on the pole straightening your arms either as you squat down or as you straighten up." STEP SQUAT for THIGHS AND GLUTES.
" Stand with feet apart at shoulder width and with knees and toes facing forwards. Hold the pole with knuckles facing forward on your shoulders behind your head, in front of you at shoulder height or as a support at the side of the body. Take a long step forward and with the same leg push back up to the original position. You can add a push up on the pole either as you go into the squat or straighten out from it. You can perform the same movement without the push up but using the poles as support." STANDING PUSH UPS for SHOULDERS.
" Stand with feet apart at shoulder width and with knees and toes facing forwards. Hold the pole with knuckles facing forward straight out in front of you at shoulder height. Raise the pole until it is above your head keeping the arms straight the whole time. Lower the pole back to shoulder height. You can also push up behind the neck and rise up slightly on your toes at the end of the push up." " Stand with feet apart at shoulder width and with knees and toes facing forwards. Hold the pole with knuckles facing forward above your head with straight arms and hands well apart. Keeping a straight back squat down to about 90 degrees or lower while keeping the gaze directed straight ahead, then straighten up again. The pole moves in a straight line up and down within the body's area of balance (toes-heels)." JAVELIN TWIST for NECK AND SHOULDERS.
" Stand with feet apart at shoulder width and with knees and toes facing forwards. Grasp the pole with knuckles facing forward and hands wide apart and bring the pole in front of your pelvis. With one hand leading the movement move the pole behind your back. Return to the basic position with the other hand leading the way. Keep the arms straight throughout." SHOULDER FLEX for NECK AND SHOULDERS.
" Stand with feet apart at shoulder width and with knees and toes facing forwards. Hold the pole with straight arms and hands apart at shoulder width in front of the pelvis. Lift the arms up by flexing the shoulders, hold for a moment then return to the basic position." UPPER TORSO TWIST for STOMACH MUSCLES.
" Stand with feet apart at shoulder width and with knees and toes facing forwards. Hold the pole behind the shoulders with hands relaxed on top of it. Twist the mid-torso by bringing either end of the pole forward alternately. Keep your gaze fixed straight ahead throughout." STRETCHING IN STEP SQUATS for FRONT OF THIGHS AND HIP EXTENSORS.
" Stand with feet apart at shoulder width and with knees and toes facing forwards. Hold the poles as supports by the side of the body. Step forward with one leg. Keep the leg straight and gaze directed upward and gently push the hips down towards the ground. Repeat on the other leg." FORWARD BOW for BACK OF THIGHS AND CALVES.
" Stand with feet apart at shoulder width and with knees and toes facing forwards. Bring one leg slightly forward and at the same time lean on the poles. Push the upper torso forward with straight back and forward leg straight at the knee. You can also hold the poles with straight arms low down in front of you." Began in early 1930s in Finland, for off-season training by competitive cross-country skiers. In early 1980s in Finland, developed as a physical recreation. 1997: Exel introduced the first official Nordic Walker poles. 2004: over 3.5 million Nordic Walkers at end of year (estimate by Nordic Walking association). They have some beautiful poles. Also they offer you a FREE "specially tailored Nordic Walking Fitness Program. Recommended heart rate levels given ... are calculated on the basis of the information you supply and ... meet your particular fitness requirements." INWA (International Nordic Walking Association) (founded in Finland in 2000). "Nordic Walking" (DVD), the World's first professional instructional DVD for Nordic Walking. Starring Lise Meloche (Director David McMahon). "Nordic Walking"
best books read. Current Blog (book log!). Reviews of Harry Potter books. Home. Basic Buddhism. Forests of California and Trees of the World. Poetry - Learn How to Write Your Own.